Kashmir and 17 people, including seven journalists, were hurt in an ongoing gunfight in the heart of the summer capital, police said. One or two armed militants attacked a paramilitary bunker in Srinagar's Lal Chowk commercial hub with rifle fire and a grenade, sparking panic among passersby, they said. "The fire was returned and in the initial exchange of fire 12 people were injured," the officer told AFP. The bunker is at the gate of a paramilitary camp which also houses a Hindu temple. Five more people were hurt in further exchanges of fire and a police vehicle burst into flames after being strafed with bullets, police said. They said five cameramen working for Indian television networks and two photographers for a local Urdu newspaper were among the injured along with five border security guards, two policemen and two civilians. As darkness fell, firing continued between security forces and the militants holed up in two or three buildings in the main square. Militant groups Al Mansurian and Jamiat-ul-Mujahideen claimed responsibility for the attack in separate calls to local news agency Current News Service. Men, women and children were seen running for cover as the fighting broke out, an AFP correspondent at the scene said. Police and paramilitary forces cordoned off the area and launched searches to flush out the militants. "We have been showing a lot of restraint to prevent damage to the property and businesses," Deputy Chief Minister Mangat Ram Sharma told reporters. More than 44,000 people have died since the start of an Islamic rebellion in Indian-controlled Kashmir in 1989, although separatists put the toll twice as high. Elswhere in the Himalayan state, two policemen were killed in an ambush by rebels in the southern district of Doda on Friday, police said. In the northern district of Rajouri, suspected Islamic rebels lined up five Hindus and killed them by slitting their throats, the Indian Border Security Force said. It was unclear what provoked the attack. A Muslim woman died in the same district after rebels also slit her throat, police said, adding that suspected militants also killed a policeman's wife and nephew in another northern district, Kupwara. 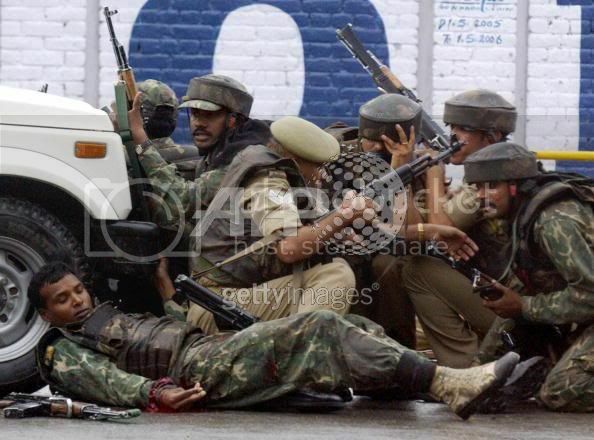 Suspected rebels also killed a Muslim youth in Srinagar Friday, a police spokesman said. Muzaffar Hussain, a news cameraman, runs for cover minutes before he was hit in the crossfire between suspected rebels and soldiers, in Srinagar... He is in Critical Condition. Did they target the journalists, or did they just happen to be "at the wrong place at the wrong time"? What is the general situation in Kashmir now by the way? They Died or were Injured Performing their Professional Duties ........ The Whole Episode was Broadcasted Live form the Ground Zero ........ I could see Bullets Flying ,People/Journilists Going Down ...... but the Cameras kept Rolling ..........In an attempt to get the best visuals, the journalists rushed close to the shootout site and were hit by militant's bullets. This Guy was still Holding the camera when he got Shot in the Stomach .......and in the Video i could see him being Shot and fall down and his camera tumbling ....... another man rushed towards him showting "he got Shot" ....... he was rushed to hospital and another man holds the camera ..... One of his Kidney and part of Large Interstine got Damaged and Had to be removed ......... His Condition is Still Critical. This is Just Like anyother day in the Life of a Average kashmiri ....... Army says the Insurgence around this time is Quite Normal as the Snow Starts to melts and MIllitants try to Cross over from Pakistan...... which has been impossible durign the winter. Kashmir's main city entered its second day on Saturday. An unspecified number of militants were holed up in two buildings in the heart of Srinagar after they raided the city's main business centre on Friday afternoon, sparking a fierce battle with troops. "We are planning to storm," K. Srinivasan, a senior security official, told Reuters. "There was intermittent exchange of fire throughout the night." Witnesses said close to one km radius had been cordoned off by hundreds of troops, who were backed by armoured jeeps and trucks mounted with machine guns. Television cameramen and photographers who had rushed to cover Friday's firefight got caught in the crossfire. Seven were hurt, including a cameraman who was in a critical condition after being shot in the stomach. In Srinagar, streets were quieter than usual as many people stayed indoors to keep out of the way. Two Islamic groups fighting New Delhi's authority over Kashmir, Al-Mansuriyan and Jamiat-ul-Mujahideen, claimed responsibility for the raid. New Delhi has said that despite a peace process with nuclear rival Pakistan, Islamabad allows Muslim militants to infiltrate into Indian Kashmir from the Pakistani side of the bitterly disputed Himalayan region. The chief of Kashmir's ruling People's Democratic Party said separatist guerrillas were launching dramatic attacks to derail the peace process. "We will not let this happen," Mehbooba Mufti told reporters. On Friday, Pakistan President Pervez Musharraf tried to ease Indian concerns over reports that militant camps were re-opening on his country's side of the line, saying the situation was "on the mend". More than 45,000 people have been killed in the revolt in mainly Hindu India's only Muslim-majority state of Jammu and Kashmir. Police and soldiers have killed two militants in Indian-administered Kashmir after storming two buildings in which they were hiding. At least two soldiers were killed and several others injured in the intense gun battle which raged in the summer capital Srinagar for over 24 hours. 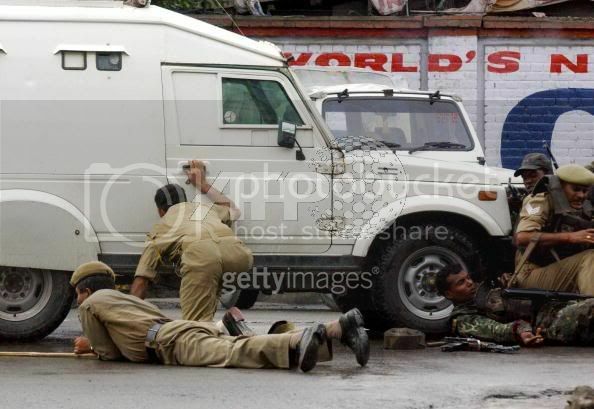 The injured included several civilians and journalists who were caught in the exchange in the heart of Srinagar. Violence had ebbed in Kashmir after peace talks between India and Pakistan. The clash began on Friday evening after militants belonging to the Al-Mansurin and Jamiat-ul Mujahideen militant group attacked a police vehicle. "We have killed both the militants who had barricaded themselves inside a hotel and a shopping complex," a spokesman for India's Border Security Force, Virender Manhas, told journalists. However, the militant Jamiat-ul Mujahideen group says two members of its group who were also involved managed to escape. Soldiers also evacuated more than 70 civilians trapped in nearby buildings since the clash broke out. Several journalists and civilians were caught in the crossfire. Television cameraman Manzoor Ahmed was badly injured but hospital authorities say his condition has improved. Also on Friday, suspected Muslim militants raided a village in Indian-administered Kashmir, slitting the throats of five Hindus, police said. The attackers entered Dhoob village, 200km (125 miles) north-west of Jammu and segregated Muslims from Hindus before the killings, the police said. About 40,000 people have been killed in fighting between Indian security forces and militants in the region since 1989. Violence has escalated after a period of relative calm following peace moves between India and Pakistan. The peace moves are aimed at ending decades of dispute over Kashmir - a region both countries claim in its entirety. India accuses Pakistan of sponsoring a violent uprising in Kashmir, a charge Islamabad denies. Pakistan says it has only given diplomatic support to militant groups in the past and has now taken steps to ensure they no longer have bases in the country.